As a corporate official in charge of overseeing and managing compliance issues within an organization, the Chief Compliance Officer maintains knowledge about the recent policies and procedures, encouraging managers and employees to report suspected fraud and other improprieties without fear of retaliation. Compliance with ongoing developments from Dodd-Frank Act, PCI-DSS, GLBA, FISMA, SarbanesOxley Act, Joint Commission, and HIPAA are of high priority for different fields. Given the scale of the regulatory framework, it is clear that large-scale information systems are necessary for major corporations to achieve compliance and to mitigate associated risks. While compliance often is initially viewed as an unnecessary administrative burden with untenable costs, the motivation behind the legislation is typically a result of industries’ inability to effectively address significant shortcomings in business practices. Corporations have become concerned about compliance because of increasingly stringent and complex legal requirements. In this realm, there are many technology developments that enable significant improvements in fraud detection systems, ensuring compliance. To help CCOs, CIOs, and CEOs find the right compliance technology and provider for their enterprises, our selection panel has evaluated hundreds of compliance technology providers that own innovative technologies in this space. In our selection, we looked at the vendor’s capability to fulfill the burning need of cost-effective and flexible solutions to tackle complex compliance challenges. 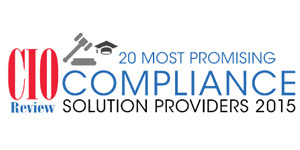 We present to you CIO Review’s 20 Most Promising Compliance Technology Solution Providers. Workiva Inc. Provides a cloud-based productivity platform for enterprises to collect, link, report, and analyze business data with control and accountability.